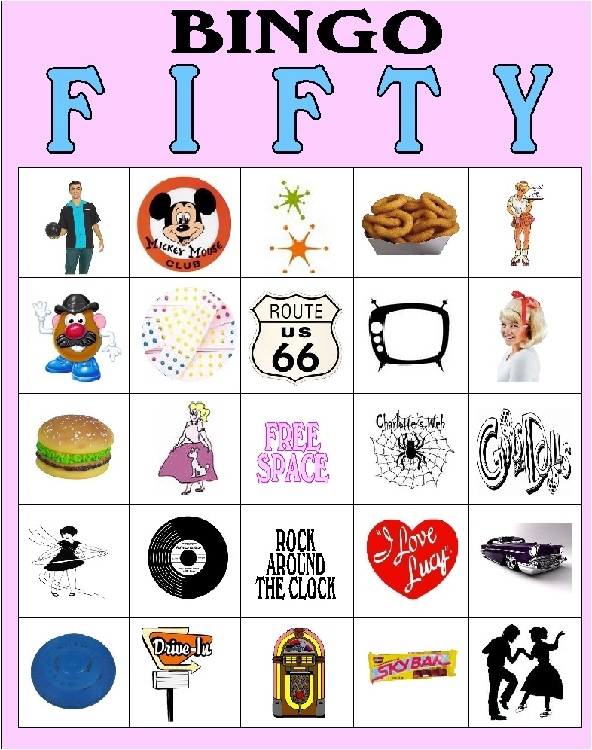 After hours of searching graphics, designing bingo cards, and planning how to make this work, I found 50 graphics that had to do with the 1950s. 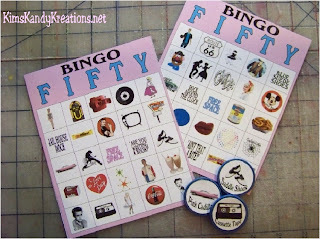 Then..I decided to share this Bingo party printable with you! Go HERE to purchase($5.00) and download the entire printable set. Once you've downloaded it, it's very simple to assemble and play. There are 30 Bingo cards in 15 pages (2 to a page) and 50 graphic piece circles (25 on each page). They come as a JPEG file for you to simply print out. Once you print them out, you can cut the cards out. 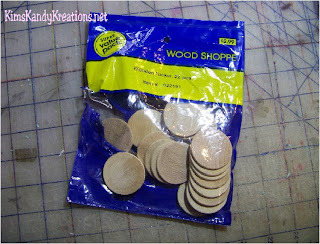 The discs are 1.25 inch circles so if you're lucky enough to have that size hole punch, you can use that. If you don't want to go any further, you can just play now. Since there are 50 printable tags, I bought 2 big bags. Then I spray painted them blue. 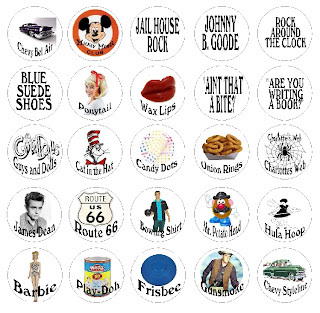 You can then use your Xyron or Modge Podge to put each graphic onto the wooden disc. 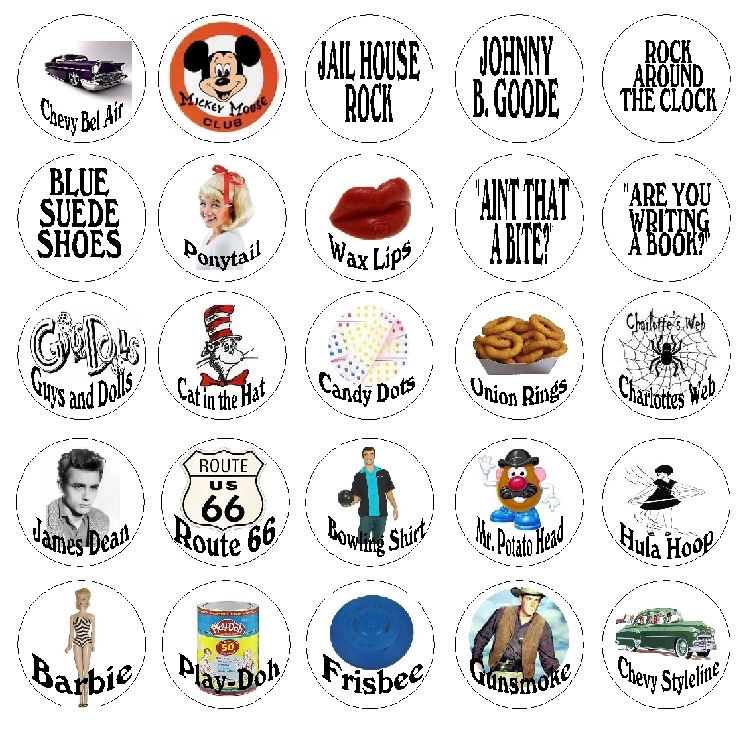 I'm not sure yet if I'm going to put the graphic tabs into a cute bag that I'll make, or just a bowl. We'll see how creative I get. In the meantime, just place the graphic discs into a container and draw them out. 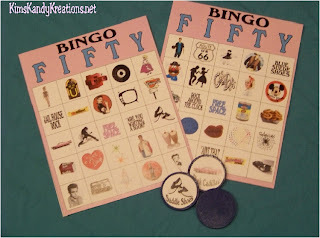 Then, wait for a fun game of BINGO! Oh my gosh, this is sooooo cute!!! I love 50's anything!! So cute! I'm going to have to try this. 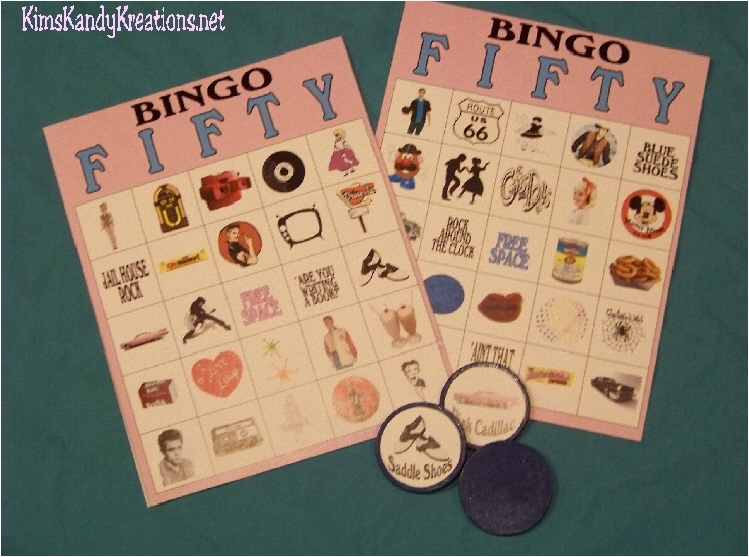 I love all your 50's party theme decorations! and placing the bingo pieces on wooden circles in so stinkin' clever! You Rock! That's really cute! 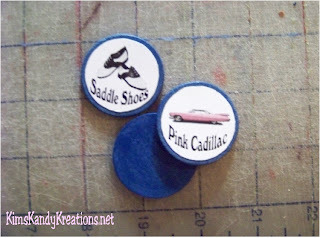 Love this idea ! looks like you are going to have a fun party!